Joyce Glasser reviews An Artist’s Eyes (October 24, 2018), Cert. 12A, 77 min. 79-year-old film and television director/ producer Jack Bond might be best known for his work on the South Bank Show, but he directed many documentaries about artists, beginning his career with a film about – and starring – the surrealist showman Salvador Dalí. 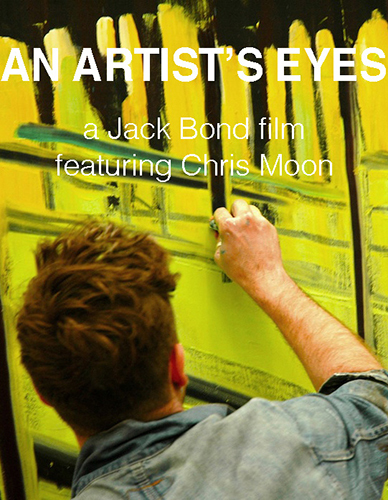 Bond is now back on the big screen with a new documentary about a highly collectable, up-and-coming British artist named Chris Moon. An Artist’s Eyes examines Moon’s complex relationship with his art, but we spend more time looking at the artist eyes than we do looking through them at his art. The image Moon projects at a show in Chelsea, NYC has something of the movie star about it. With his artfully paint-splattered leather jacket, unnecessary shades, 3-day growth and his thick hair stylishly coiffed, he poses for bombastic rock star photographer Mick Rock. But Moon is uncomfortable. Rock barges in on a workmanlike gallery hanging and subjects Moon to a barrage of foul language and sexually explicit teases, perhaps intended to provoke a reaction out of the bemused subject, clearly focused on his show. 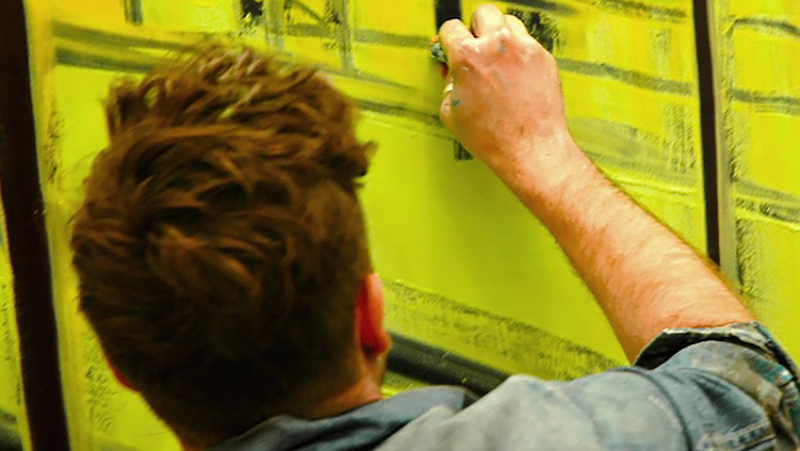 According to his art dealer, Liam West, Moon has been working on the six paintings right up until the doors opened. This is the dichotomy of Chris Moon as captured in Bond’s documentary. Dubbed James Dean with a paintbrush, Moon is portrayed as a cool bohemian who tells us, ‘I go where the painting takes me… If I find a space I move in and stay until it gets too much and then I move on.’ James Dean was, like Moon, a free-wheeling, dedicated artist who eschewed comfort (we see Moon in a cold Manhattan studio with dodgy electricity), but Dean quickly became an icon and a poster boy. We see Moon, walking through the snow covered streets of Manhattan in footage reminiscent of the famous 1955 shots of Dean walking through Manhattan in freezing rain with a cigarette hanging from his mouth (Moon smokes too). There is a kind of sound track to Moon in the film, too. In the opening scene Moon is contemplating a blank canvas before attacking it with sweeps of colour to the moody, sombre song, Hold Me Close, Holy Ghost from Gabriel Bruce’s Come All Sufferers album. It is the kind of haunting, inchoate, brooding and melancholy music that fits Moon himself and some of Moon’s work, but not all of it – with its explosions of fauvist colours. Bruce wrote the songs in this album after a painful breakup and an accident in which his fingers were almost amputated. We learn little about the personal inspiration behind Moon’s works or about his life. He collects old cars; is a self-taught painter and there does not seem to be a woman or children in his life, although he travels through Andalusia with Ian Morrison, a photographer. We do not know whether this is personal or professional but Morrison is (like Rock) as interested in photographing Moon as the landscape and buildings. In speaking about these surroundings, Moon tells us that he soaks up the atmosphere and the vibes of places he visits and this is what ends up on his canvases. In NYC, people are more important than place, although this is not immediately obvious from the six paintings on display. The idea of an artist living in fear over the direction of his work is not explored, but it brings Moon into Gabriel Bruce’s sphere of sufferers. Still, the dichotomy underlying the documentary continues when we visit Moon’s Essex house and studio, a slightly ramshackle, rural retreat where his car collection, including a beautiful vintage white and power blue Chevrolet pick-up, is stored. This is the perfect setting for a tormented artist, but Moon also has a massive studio in the now trendy, high-tech, artsy and pricey Kings Cross neighbourhood. The art critic John-Paul Pryor has compared Moon to Francis Bacon and the press release tells us that Michael Fassbender, Gemma Arterton and Sir Paul McCartney own his works. We learn in the film that a show in Fitzrovia sold out and the Chelsea show in New York is packed. We do not hear from the collectors or Pryor, however, so the hype comes without the educational substance or context. 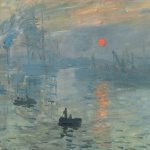 And we do not see enough of the art – through Moon’s eyes or our own – to get much of an angle on this clearly collectable talent. The painting Moon begins in his Kings Cross studio in the first scene is one of a series of trees in Epping Forest in various seasons that resemble David Hockney’s seasonal trees in a Yorkshire forest exhibited at the Royal Academy a few years ago. Moon’s paintings are pretty; some impressing with the primary colours of the Fauvists, others with soft, pastel yellows. A Los Angeles painting of a flat-roofed building against a sunset with a ‘Food’ sign on top is pure Ed Ruscha, Los Angeles’ most famous ‘pop art’ painter of flat roofed architecture with signage and gorgeous LA skies. A horse on a merry-go-round pole is reminiscent of Mark Gertler’s 1916 Merry-Go-Round at the Tate Britain, and of German Expressionism. There is also something of the early Peter Doig in Moon’s paintings (Concrete Cabin, Blotter). Moon himself cites ‘someone named De Silva’, a female artist whose work looks like scaffolding as an influence. 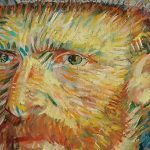 This is an appealing portrait of a man who lives to paint, but the film veers into promotional territory as it departs from the contextualised art world. Still, it’s good to see that Bond is back with his eye on emerging talent.